1. 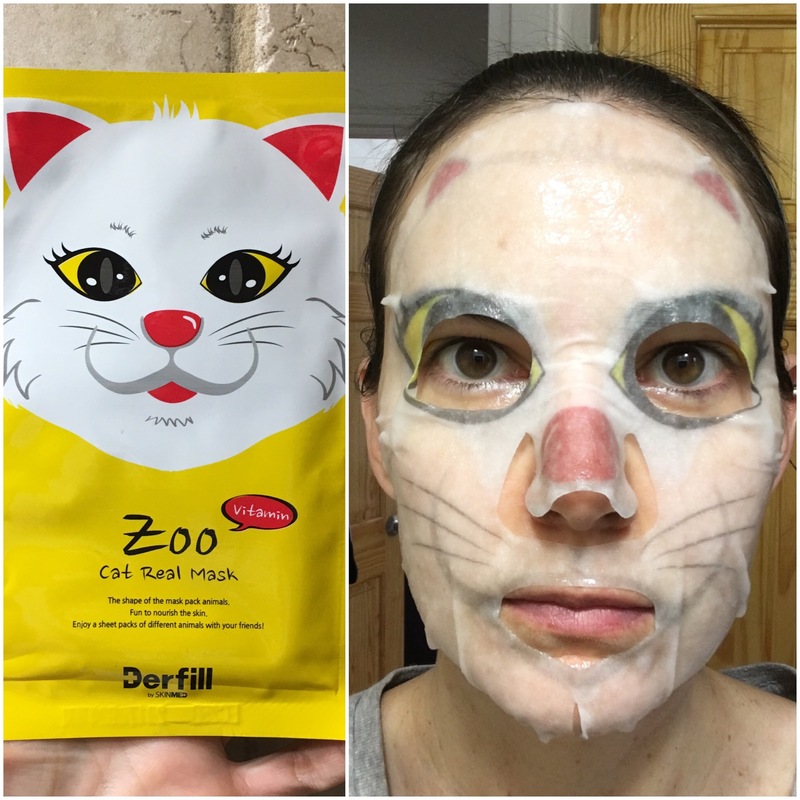 Zoo Cat Real Mask: yep, it’s time for another edition of “my husband hates these so much!” (For the record, my Resting Sheet Mask FaceTM is what disturbs him more than the masks themselves.) This is my first foray into sheet masks that look like things other than straight up Hannibal Lecter, and because I’m a Certified Cat Lady I started with this cat mask. This one is from my Memebox sheet mask haul a couple months back and it cost me just $1.95 because of a sale the site was running. So creepy/fun! 2. 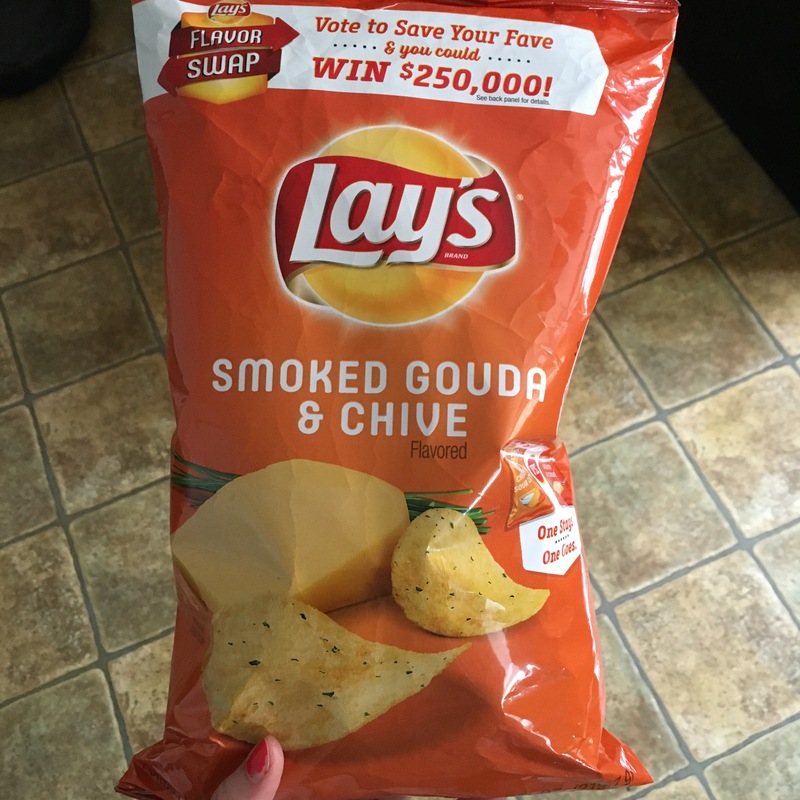 Lay’s Smoked Gouda & Chive Potato Chips: I can’t resist new chip flavors, and the instant I saw the words “smoked gouda” on this bag I knew there was no way it wasn’t coming home with me. These chips truly did not disappoint. They’re part of this “flavor swap” thing where people vote on whether a new flavor should replace an old one (in this instance, it was Smoked Gouda & Chive vs. the old standby Cheddar & Sour Cream). In all four cases the old flavor won out, so I have to assume it was all just a marketing stunt and Lay’s was never going to do away with the old flavors. Regardless, I’m sad that these tasty chips will presumably disappear from shelves soon. 3. 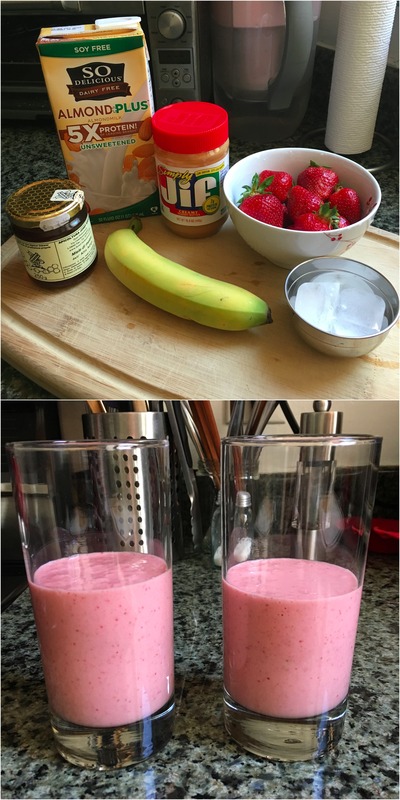 Homemade Smoothies: it’s been years since I made a smoothie at home, but I started doing so again last weekend and I’m loving them. I make a damn good smoothie, if I may say so myself. 🙂 What I’ve been blending up this week: a banana, several strawberries, a teaspoon of honey, a tablespoon of peanut butter, about 1/2 to 3/4 cup of unsweetened almond milk, and two ice cubes. The honey is a local Dolomite honey we purchased on our honeymoon, and as you can see I used Simply Jif (I loathe natural peanut butter that needs to be stirred). Blended together, these ingredients become a deliciously frothy smoothie. 4. 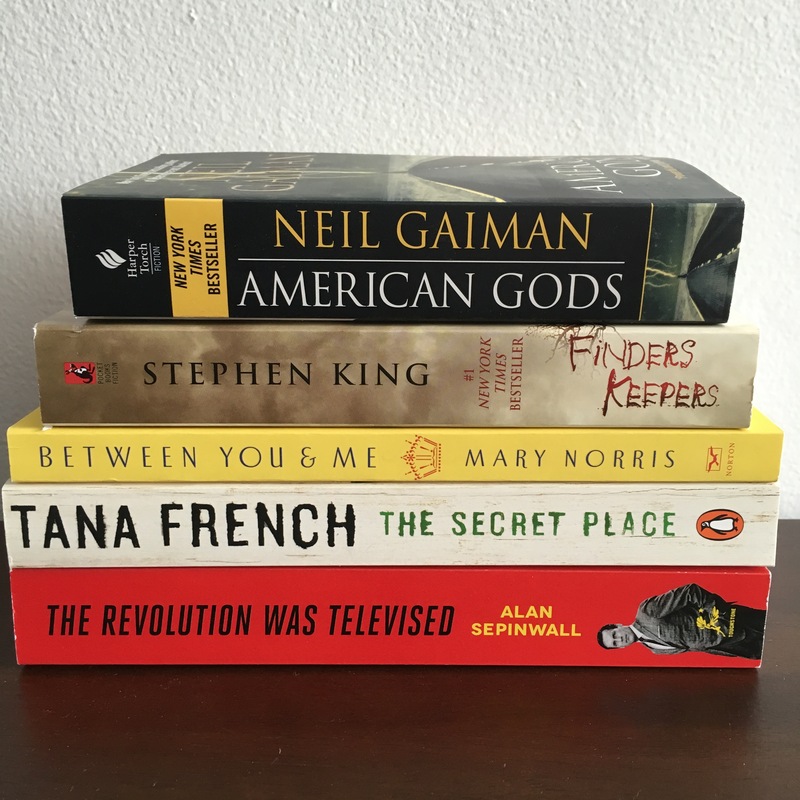 New Books! I’m almost through my backlog of unread books in the apartment so I treated myself to some new ones: American Gods by Neil Gaiman, Finders Keepers by Stephen King, Between You & Me: Confessions of a Comma Queen by Mary Norris, The Secret Place by Tana French, and The Revolution Was Televised: The Cops, Crooks, Slingers, and Slayers Who Changed TV Drama by Alan Sepinwall. I’ve already started the Sepinwall book and am eating it up. TV Nerds FTW! 5. Chobani Chipotle Pineapple Flip: me + new flavors of familiar foods = happy (see above re: chips). 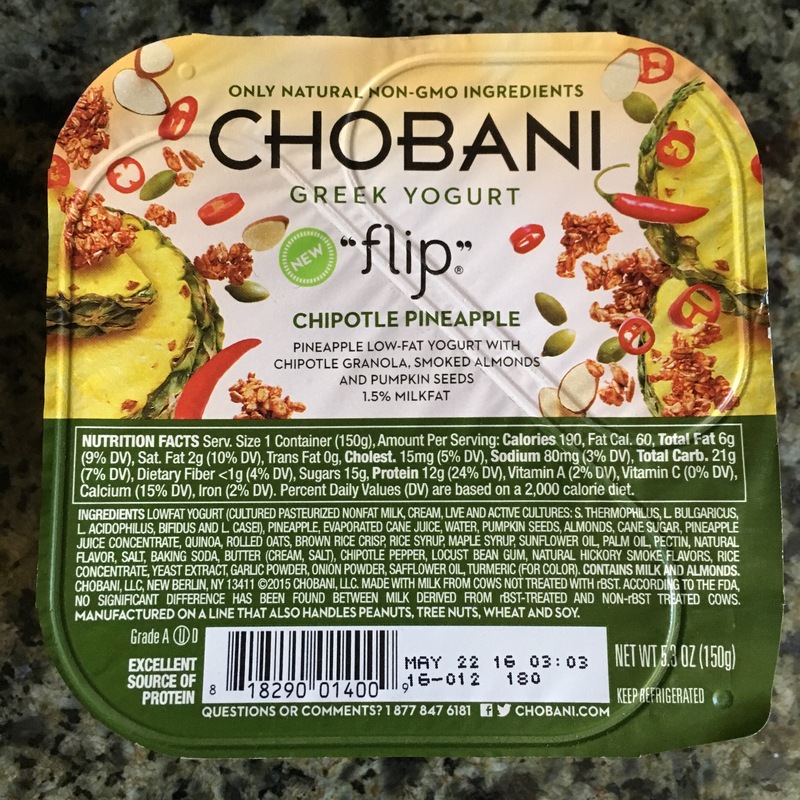 I’m happy that Chobani has introduced a couple somewhat savory flavors to their line of Flips, which seems to be expanding rather rapidly. I really enjoyed this one, which had the right balance of sweet, sour, savory, and crunch. I’d totally buy it again, and I also need to try the Sriracha Mango flavor!